State House on penultimate day of 2014 session. 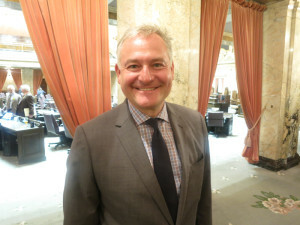 OLYMPIA, March 13.—On the final day of the 2014 Legislature, lawmakers are poised to pass a bill that would shut down all of the state’s medical-marijuana dispensaries and require patients to shop at the state’s soon-to-open highly-taxed recreational-marijuana stores. 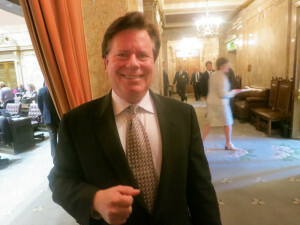 The last-minute plan, dropped on the bar of the House late Wednesday evening, is the surprising result of a session-long effort to carve out a new role for medical marijuana, in a state where the once-forbidden drug will someday soon be sold to all comers. It started out as a bill to save the medical-marijuana biz. Now it ends it. House Finance Chairman Reuven Carlyle, D-Seattle. 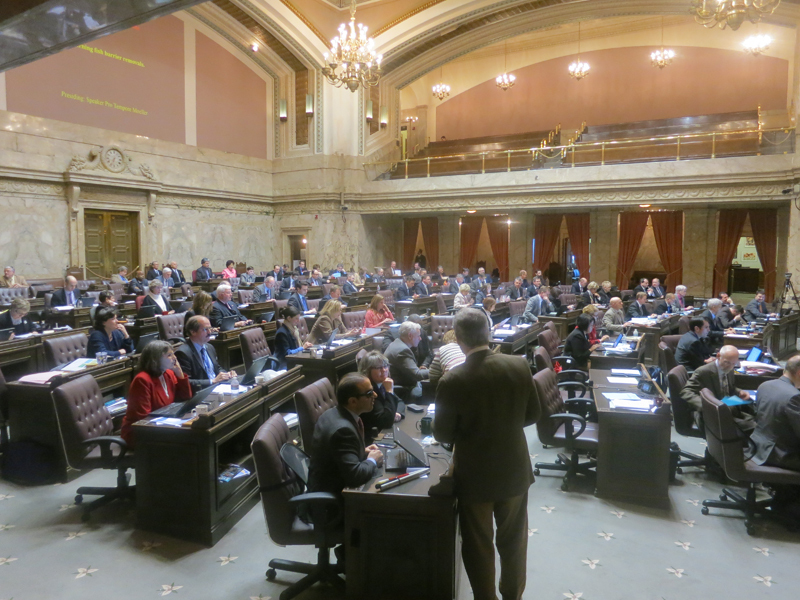 Even in a Legislature where strange things sometimes emerge under the pressure to get something done on the final day of a legislative session, this one was a stunner – a proposal that does a 180-degree turnabout from the original bill. Lawmakers say they are compelled to pass some sort of a bill regulating the state’s 500-or-so medical marijuana dispensaries. Otherwise federal law enforcement authorities might attempt to block the state’s bold new effort to allow legal marijuana sales to the state’s populace as a hole. For complicated political reasons, they weren’t able to reach agreement – so the easiest thing to do is to shut down the medical-marijuana sales channel entirely. The plan will be introduced in the form of a striking amendment to Senate Bill 5887 on the House floor sometime today. House Democrats spent hours behind closed doors Wednesday night discussing the measure. It is unclear how the Senate will react. Medical-marijuana advocates are hoping the Senate will kill it. Craig Engleking of Americans for Safe Access. You might say it is one of those measures that demonstrates why there are public-notice requirements for bills, and why there sometimes is a furor when the Legislature disregards them. By the time the state’s medical-marijuana patients and dispensary owners find out about it, the deal may already be done. Shocked Spokane dispensary owner Paul Lugo, owner of The Herbal Connection, contacted late Wednesday night by Washington State Wire, said he has been trying to read and follow and understand every gyration of the medical-marijuana bill as it has gone through torturous revisions at the statehouse. But there is no way he’ll be able to make it to Olympia in time to change any minds. Lugo noted that in Colorado, Washington’s partner in marijuana legalization, where state-sanctioned marijuana stores have already opened, commercial shops ran out of product within days and prices went sky-high. If the separate channel for medical-marijuana sales had not been preserved, patients who rely on marijuana and marijuana-based medicines for treatment of chronic conditions would not have been able to get the product they rely upon. The bill, as it passed the Senate Saturday, would have allowed Lugo to apply for a state license. Now it will require him to shut down by Sept. 2015. The strange outcome comes as the result of an 11th-hour political argument in the state House. Republicans argued that if the state was going to make big revisions to Initiative 502, the landmark measure that legalized marijuana in this state and opened the door to state-licensed and regulated stores, then lawmakers ought to reconsider the tax structure as well. The heavy taxes that will be levied on commercial marijuana sales are expected to generate hundreds of millions of dollars every year – as much as $500 million, according to an early estimate from the state Office of Financial Management, though many suggest that might be optimistic. 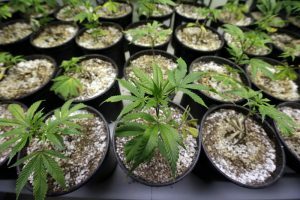 But the initiative did not impose those same taxes on the state’s medical-marijuana dispensaries, which have been operating under a gray area of the law since voters approved the sale of marijuana for medicinal purposes in 1998. Until now, state officials have been loath to regulate and provide any sort of state sanction for the sale of a substance that remains illegal under federal law. And so the dispensaries have operated in a rather shadowy fashion, some remitting sales taxes, some not, as they serve an estimated 150,000 patients statewide. Best guesses at gross revenue put the figure at about $300 million a year. The U.S. Department of Justice has promised to look the other way when the commercial retail stores open. But it has hinted that there will be legal repercussions if far-less-expensive medical marijuana, available through easily-obtainable physician “authorizations,” provides competition for the recreational marketplace. So lawmakers say they are compelled to pass some sort of legislation this year. 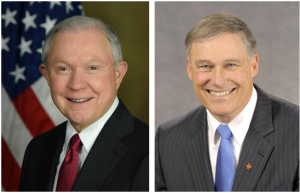 In the House, Republicans argue that the bigger issue of marijuana taxation ought to be considered at the same time – local governments deserve a cut, they say. They have leverage because a change to the tax structure would amend I-502; a two-thirds vote is required in order to amend an initiative within two years of passage. Thus their votes would be required. House Democrats are loath to give up a penny of projected tax revenue – they say they need it for public schools. And if a bill has to pass, and amendments to I-502 are impossible, the easy way out is just to shut down the entire medical-marijuana business. 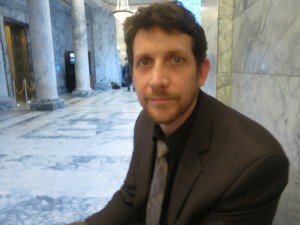 State Rep. Cary Condotta, R-East Wenatchee. 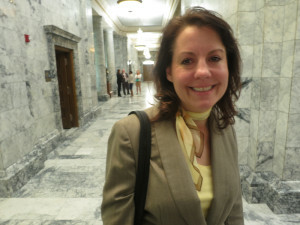 The striking amendment, sponsored by state Rep. Eileen Cody, D-Seattle, would continue to allow patients to grow for themselves. But if they wish to purchase medical marijuana, they would have to do it in the same commercial stores that serve the populace as a whole. The bill would create a voluntary “registry,” and patients with a medical-marijuana card would be entitled to a sales-tax exemption. But they would still be subject to the same high marijuana tax rate that applies to other marijuana purchasers. 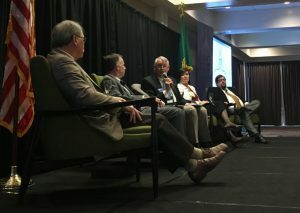 The bill may well be a boon to the very black market that Initiative 502 was supposed to combat, Condotta said. Many cities and counties are enacting moratoriums that would prevent the state-sanctioned shops from opening, on the grounds that marijuana remains illegal under federal law. But much has to do with the fact that they don’t get a share of the tax revenue. If marijuana isn’t available across major swaths of the state, how are people who need it going to get it? “They’re just building the black market,” he said. Dispensary-owner Lugo noted that 40 to 60 percent of the marijuana that flows to medical-marijuana dispensaries is grown by patients themselves. They’ll keep growing it, he said. “Where do they think that product is going to go?” Under rules adopted by the Liquor Control Board, they won’t be able to sell their excess to the new retail stores — only big operators can do that, under tightly monitored conditions. And if green-thumb gardeners can’t sell it to dispensaries, it’s going to go to the friendly neighborhood drug dealer. Odds are he’ll be able to compete rather well with the retail stores. He won’t be paying taxes. State Sen. Ann Rivers, R-La Center. But right now, it is safe to say, the disparate forces in the medical-marijuana community are in agreement – best thing to do is to kill the bill. 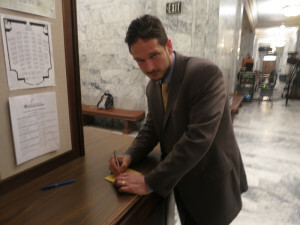 Working the doors: Ezra Eickmeyer of the Washington Cannabis Association.